GLAD NO MATTER WHAT by SARK is presented more as a living, breathing thing than another book on loss. This remarkable book is the author's journal, and as a working-journal in which the reader may add personal explorative thoughts and feelings on a few pages. The book invites us to laugh and roll with feeling, page by page. SARK courageously describes episodes of loss in life, particularly a phase of life where she grieved the death of her parents and a loved and revered pet, just as a love-life relationship ended. 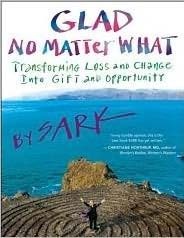 The title of this book shows the determination behind it, for SARK learned how to be "glad no matter what" even during this extraordinarily hard time of life, and this book is about the strength these situations and others gave her. GLAD NO MATTER WHAT is hand written in a rainbow of bright marker colors, in the author's own hand and is visually very bold. At times the enlivening boldness of the print on page is contradictory, the reader is drawn in by the bold and beautiful color of the print, which has a celebratory feel; yet, while the print itself gleefully marches along, it often imparts sorrowful truths as it does so. The boldness of the print makes it all seem so BIG and bright that some readers may have to push through that to get to the tenderness of the actual words themselves. The meanings of SARK's words often feel they need to be whispered, and we might rather see them in paler, pastel colors quietly tip-toeing across the page, for the heart is delicate at times and certain life situations shrink from exposure (such as the awful abuse she endured from an older brother). Yet, as SARK endured many hardships and her spirit compelled her forward, she tells of her life experiences as though shouting them from the roof-top--and why not? Maybe the boldness in her honesty and expression is what it takes to help others get beyond their own sorrows. In fact, she describes how in moments of grief, people frequently change the subject, rather than bringing feelings out into the open. SARK is saying that for too long we've been too passive or even shamed into silence, in our grappling with loss and change, and she seeks to readdress this in a fresh and lively way, her own way, and she does just that. Readers of this book may not feel so shy about their losses and emotional traumas in life, and instead may accept the chance to create change and move beyond their grief. For SARK all of these emotions around life's hardships, cruelties and confusions are to be played with, talked about, dug up and sifted into personal joy and strength. SARK writes generously, openly and honestly of her experiences of loss and change and the gifts and opportunities that may arrive through coping. This book is like an expedition, and SARK is exploring multifaceted nuggets of feeling and thought, solutions and wisdom from deep within herself as we are pulled in to explore for ourselves, to discover our own hidden treasure derived from loss and change. She is sharing the beauty that loss in life inevitably may give us and her courage in expression has the potential to influence the reader to have courage, to break out and express, to seek answers through self-expression and through contemplation (but the fun kind: she encourages genuine pleasure in contemplation). She teaches us well; Sark is entirely inclusive and personable; this is like a personal journal and she's allowing us to see her process. Her mission is to motivate and drive us to feel the joy of discovery and make well being not just possible but absolutely real. Readers of this book are more like experiencers, SARK wants us to revel, to see that we can also transform, in our way and in our own time. GLAD NO MATTER WHAT is illustrated with fun drawings, simple line work creations flashing with color, the kind of art most of us relate to. I refrain from using the word "doodle" here since I see it as a term which seeks to make purposeful and meaningful art seem non-necessary and marginal. Yet this kind of art is the best ever, it is free and alive and is very much what helps give this book the transformational integrity it has. SARK exhibits this kind of free-flow between words and drawings showing how very significant that line work is, how an arc of a line or a wiggle of color expertly completes the feeling in a sentence, and highlights the bigger concepts she introduces. These playful drawings serve also as sentimental, visual winks, which give the book vitality. The book also has photographs of a variety of imagery (a sculpture, a heart shaped cookie, of cats and people, a collage, etc.) all giving the pages texture and mobility. The table of contents breaks loss and change down in a life-enhancing way, in eight sections, each filled with unique and unexpected surprises. SARK takes us through stages of understanding grief and transformation and offers easy-to-embrace techniques that work for her in dealing with sadness and change. There are pages devoted to her favorite web addresses, books and music, complete with a multitude of helpful offerings; it is full of inspiring quotes and suggestions, from pouring baking soda into bathwater for the healing benefits, to the number to her "Inspiration Phone Line"). She isn't holding back, she's pouring out as much as she can to get anyone who reads this book to be emotive, to feel and to think and to celebrate life, even the struggles, especially the struggles. She isn't afraid to belt out what her struggles were and are, and that offers the reader a chance to participate in getting un-stuck and accepting change. She encourages us to practice accepting change. She writes, "Life presents us with so many chances to practice, because it's constantly changing." GLAD NO MATTER WHAT by SARK reminded me a bit of my own sketchbooks and journal entries. I related to it and it made me want to draw, to write, to have fun as a person and artist. I'm a life-long sketchbook keeper and illustrator of many books, so I was compelled to do a piece of art that would remind me of how this book made me feel (feelings like facing sadness, facing loss and overcoming it all by springing to life). I think being playful is mostly what GLAD NO MATTER WHAT activated for me as a reader, and this artwork I made reflects what it's like getting into a zone where self consciousness does not block the flow, and even writing about hardships is fun in a way. I believe and I feel that SARK believes that just by doing that, by getting into a flow and a zone where there is no self consciousness or self criticism, a person can get into a joyful place. A few other features of his book make it feel inventive and creative, a kind of book that keeps being available as a go-to for life situations. It has a "Feelings Menu", just after the Table of Contents, which allows a reader to be spontaneous and choose a feeling from the list (some are: scared; resistant; inspired; flat; anxious) and then go straight to that section of the book to discover ways to heal and triumph in spirit. And section number seven provides a selection of "Portraits of Joy and Transformation Through Change and Loss...", a page each devoted to personal testimonials from some of the many people she spoke with about transformation after change and loss. The book ends with acknowledgements followed by a "Transformational Change Sheet". SARK writes on the top of this page, "Give yourself the gift of change. Fill out this sheet, ask a friend or loved one to mentor you in your process of transformation," which of course feels much like we're at the beginning of the book again, or at the beginning of another exciting expedition, and she's taken us there. To order Glad No Matter What from Amazon.com, click here!